Euthamia tenuifolia.Larry Allain @ USDA-NRCS PLANTS Database. (Accessed 4/2014). 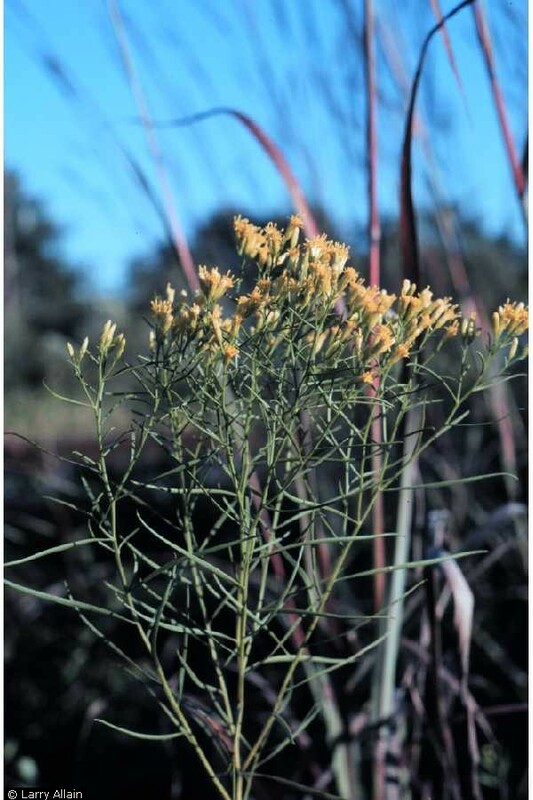 Euthamia tenuifolia is a perennial herb, clonal from rhizomes; stems 30-100 cm tall, often sweet-aromatic.Winter stem brown, slender, receptacles star-shaped, bracts overlapping. Leaves alternate, stalkless, blade 2.3-7 cm long, 0.1-0.3 cm wide, linear, 1-veined, thin; tufts of small leaves and/or branches in leaf axils. Flowers yellow, ray flowers 0. 2 cm, heads with 10-21 flowers, bracteate base 0.3-0.4 cm long, bracts in 4 rows, flowers in clusters of small heads; blooms Aug.-Oct., insect pollinated. Fruit dry, 1-seeded achene with plume of tan bristles, wind dispersed. Seeds eaten by some birds and small mammals, foliage eaten by rabbits (Martin et al. 1951). Habitat: Open areas, sandy soil, fill.